In the last post we generated ad code for your blog. Now, it is time to add this code on your pages. From Google AdSense Program Policies you know, that you can add up to 3 ads on each page. Straight to blog post With this approach you will add ad, while you are writing new post. Advantage of this manner is, that ad is better inserted into existing text, and can be on the hottest place of blog, as you can see on the heat map from previous post. You can also change position of ads in various posts. Disadvantage of this approach is, that you must know basics of HTML, and your post will be worse editable in Blogger. Next disadvantage is that visitors don’t like ads composed in text, and can reconsider, if they return back to your pages in the future. You also must check number of ads for each blog page. Update template of blog Second manner is to add your code to template, and it will be shown on each page of blog. Advantage is that you must do it only once. When you add code to header of your page, there are still on good place. In your posts will be only text and not ad code. Disadvantage is, that you will gain probable less clicks like with first approach. If you want to add more ads in template, you must find next places for them in template. 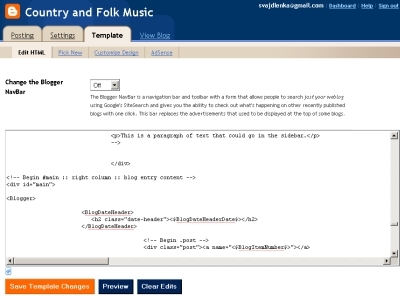 It means, that you must know basics of Blogger template code and HTML. I prefer second approach and in this post I will show you how to insert ad into header of page, what is one from the best places on page. To find right place in blog template is not easy. Various templates can have various template code, but there is possibility of Preview and it will help you a lot. Go to Blogger.com pages and login there. Select your blog, and click on link Template. You will see simple editor with your template. There, you have to find right place for your ad code. Template is divided to more parts. On top is usually CSS styles code. HTML code with body of your page starts with text <body>. You must add your code somewhere between this tag and </body> tag. If you will you find it, then with high probability you have right place for your code. It will be placed between these 2 tags. and try ad your code bellow above this tag. will be your ad. If you think there is not right place, try to change code above, until you are not satisfied, with place of your ad. When you will be satisfied replace text Your ad code here with your code from AdSense. Then press button Save Template Changes. Your changes will be saved. If you are noticed that you must republish your blog, do it by clicking on the link for republishing. I hope, that you found right place for your ad code with help of this post. If you want to add more ads on your pages, do it similar and carefully choose right place for them. Pages filled with many ads are not very interesting for visitors, and you can harm your blog. Less is sometimes more. After ads publishing you can check your AdSense reports in next days. Time shows you, if you choose right ad formats and places. If not, you know how to change them now. This entry was posted in Make Money Online and tagged Google, money, PPC. Bookmark the permalink.